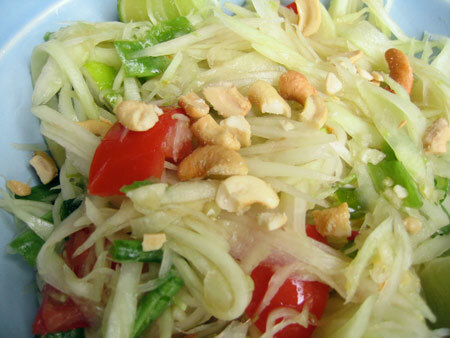 We recently came across two recipes featuring a vegetable as the main ingredient that we had never prepared before – endive. You’ve seen it – it’s sort of like a lettuce, but it’s firm and smooth and traditionally used in salads. 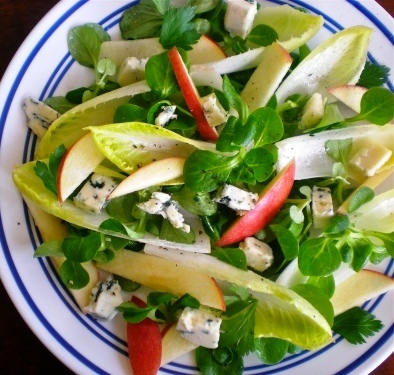 The first recipe, is just that – a salad featuring endive, but with apples, tomatoes, and tangy cheese to bring it all together. The second recipe, from the Hannaford Supermarket magazine, takes endive off the salad plate and into the oven, baking it with lemon and spices, creating a terrific side dish for meats or even just served with crusty bread. Enjoy! In a small saucepan, mix together the vinegar, oil, salt and pepper and warm over med-low heat. Arrange the endive and mixed greens on 4 plates. Top with apples, walnuts, cheese, and tomatoes. Drizzle warmed dressing over the salads. Eat! Preheat oven to 400 degrees. Trim endives: remove any discolored parts, rinse, and slice each endive in half lengthwise. Heat oil in a large saucepan over medium high heat. Add salt and nutmeg, then endives. Brown pieces quickly, turning once or twice, about 3 minutes per side. Add broth and lemon juice, cover pan, and bring to a boil over medium-high heat. Reduce heat and simmer for 7 minutes. 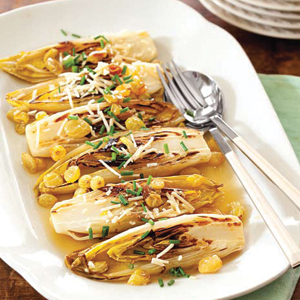 While endives simmer, chop chives and set aside. Spray a gratin pan or an 8-inch square baking pan with vegetable cooking spray. Pour enough of the cooking liquid to cover the bottom of the pan (about 1/2 cup), and then transfer endives to the pan.Sprinkle raisins between the endives, then sprinkle cheese over the top. Cover dish with foil, bake for 4 minutes, then uncover and bake another 4 minutes, until cheese has melted. Transfer endives to a serving platter and sprinkle chives over the top. Serve hot. It has b een 4 long months since the MHK went on an involuntary hiatus of sorts; I won’t bore you with the details…so that’s the end of that sentence. But we are back in full force to bring you recipes, reviews, and other tasty posts to satisfy your online foodie needs. 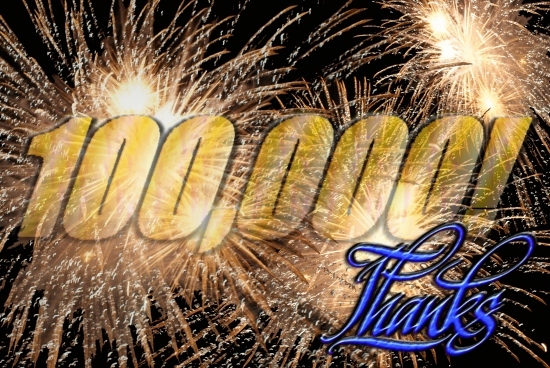 But the good news is that even without any new posts, this little blog continued to generate hits – in fact, we surpassed 100,000 hits a few days ago! Thanks so much to everyone for stumbling across the MHK while drunk at 3am…or so I assume. But now it’s back to business, so let’s get cooking! A heat wave is hitting the Northeast tomorrow, but luckily we have the perfect recipe to keep your kitchen cool and your taste buds happy. 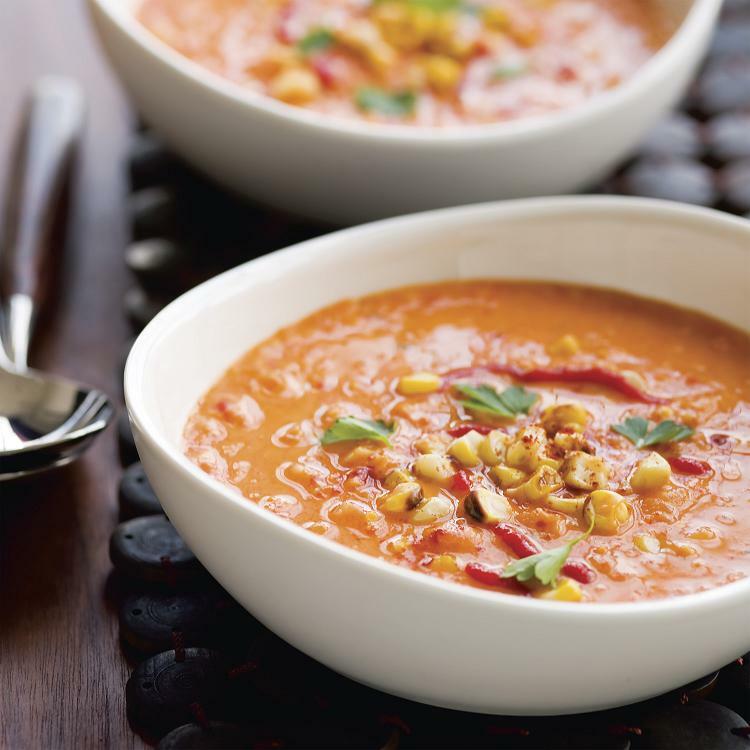 From Better Homes and Gardens Magazine, this soup combines my favorite of flavor juxtapositions – sweet and spicy. The sweet combination of raspberries, bananas, and orange juice is offset by the hot jalapenos in a very delicious way. Some may prefer a smoother soup – in that case, blend the jalapenos with the rest of the ingredients and then strain it. 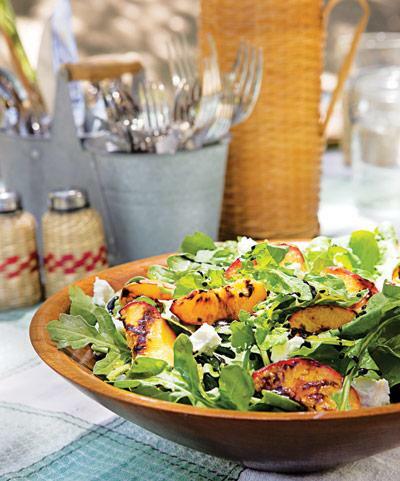 We served this with grilled corn on the cob for a fresh and colorful meal – perfect for summer! Enjoy. In a blender combine the 4 cups raspberries, bananas, orange juice, yogurt, and syrup. Cover and blend until smooth. Stir in minced jalapeno peppers, then refrigerate at least 1 hour. Serve the soup in small bowls. 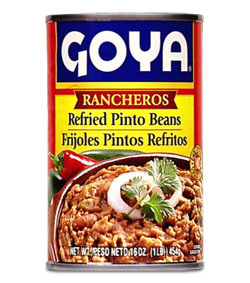 Garnish with raspberries and sliced chiles, if desired. Eat! Ok, call off the dogs – we’re still here. Sorry for the huge lapse in posting – to be honest, we hadn’t tried any new recipes or any new restaurants for a while anyway, so you really haven’t missed much. But we now have a few new recipes to share, along with a review of a local eatery. And there was much rejoicing. So today’s recipe stems from a redesign of a Hannaford supermarket magazine recipe. Their dish contained okra, which we have never really cooked in the MHK, so I was looking forward to giving it a shot. But apparently – and maybe it was just me, I don’t know – okra goes bad in four days. I had it in a plastic bag in the fridge and when I pulled it out, it had white gunk (technical foodie term) all over it. Disappointment set in, but we rebounded magnificently. The original dish seemed Indian in nature, but without any typical Indian spice. Years ago in California, we had eaten an egg curry dish at an Indian place, so we decided to substitute eggs for the okra, and added some garam masala (very typical Indian spice blend). The result was terrific. 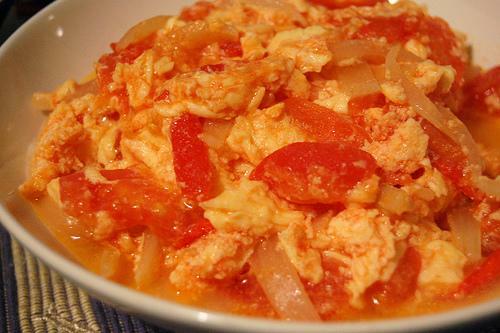 The flavors of the onion, garlic, and hot peppers soak into the tomatoes and broth, and the eggs provide a nice texture (plus they soak up the bright flavors too). Serve this over rice with some naan too. Enjoy! Heat oil in a large saucepan over medium heat until hot. Add onion, peppers, and garlic. Cook 5 minutes, stirring frequently. Add tomatoes, broth, sugar, salt, and cayenne. Stir well. Bring to a boil over high heat. Reduce heat to medium low and simmer about 5 minutes. Meanwhile, cook the eggs in a separate pan until just cooked through. Place eggs into the saucepan, stir to combine and cook for one minute. Remove from heat, stir in cilantro. Serve over rice. Eat!